Minnesota Vikings safety Harrison Smith against the St. Louis Rams at TCF Bank Stadium. 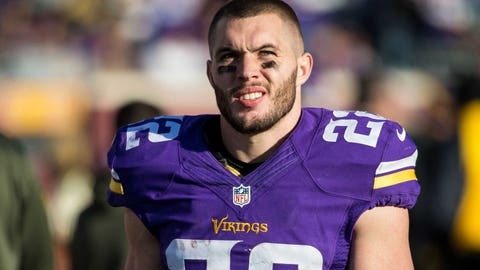 EDEN PRAIRIE, Minn. — Harrison Smith could have waited until next year to become a free agent and, perhaps, found more money on the open market with other teams bidding against the Minnesota Vikings. "You always want to be recognized as one of the top guys at your position," Smith said Tuesday, the day after signing a five-year contract extension with an annual average value of $10.25 million. "I think if you’re a competitor you always see yourself like that. There’s a lot of mutual respect between myself and the organization. I think that just reflects that." The relationship has been built through Smith’s agent, Brian Murphy, who also represents defensive end Everson Griffen, tight end Kyle Rudolph, center John Sullivan and cornerback Trae Waynes on the Vikings. "We don’t have to deal with any of the usual posturing or feeling-out period," Murphy said. "We have too much respect for each other to do that." Smith’s new deal, including a $10 million signing bonus, guarantees him $28.578 million. "It doesn’t have to be acrimonious. The Vikings had a very clear goal of tying up Harrison for the next five years, and that aligned with our goal of making Harrison the highest-paid safety in the league," Murphy said in a phone interview. The Vikings extended Smith a year ahead of time, but they waited with Griffen. Murphy gained more trust in 2014 when he spoke honestly to Spielman and Brzezinski about his client’s market value as free agency approached. "The trust really comes from when you say something, you mean it," Murphy said. Said Smith of Murphy: "There’s a lot of horror stories with fighting and agents and teams, and that’s something I don’t want. I want things to be fair for both sides, and I think that’s something he’s always done a good job of." The only unresolved issue remaining on this defense, then, is the strong safety spot next to Smith that’s been in flux since his rookie season. Sendejo is still around, "solid like he usually is," coach Mike Zimmer said of the special teams standout. "It’s still a work in progress. We’re trying to look at all the different guys," Zimmer said. 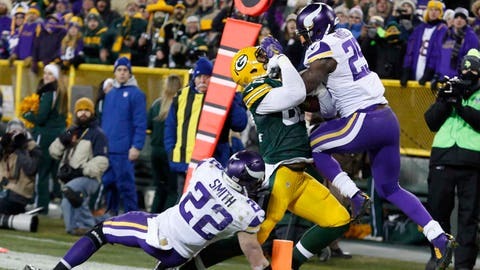 Smith’s focus is more on the whole defense, with a wealth of recent first or second-day draft picks around him in cornerbacks Waynes, Xavier Rhodes, and Mackensie Alexander, linebackers Anthony Barr and Eric Kendricks and defensive linemen Sharrif Floyd and Danielle Hunter. That’s a capable group behind a seasoned core of defensive ends Griffen and Brian Robison, defensive tackle Linval Joseph, linebacker Chad Greenway and cornerbacks Captain Munnerlyn and Terence Newman. "There’s too many good players, good guys, good coaches," Smith said. "I would have been very disappointed to not stick around for things that we have the potential to do."